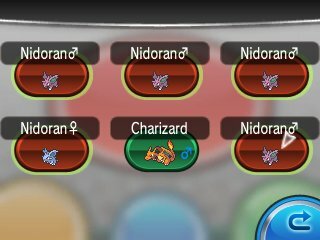 The mechanics of Horde Battles may seem daunting at first, but in actuality, the move targeting system works akin to Triple Battles. In this scenario, the moves act as if you are in the middle of a Triple Battle and so if you need to target moves accordingly. Moves like Surf will hit all opponents while others will just hit the middle three. If you're trying to take out specific Pokémon in order to capture one, they go left to right from the screen and are matched clockwise from your position in the targeting screen. 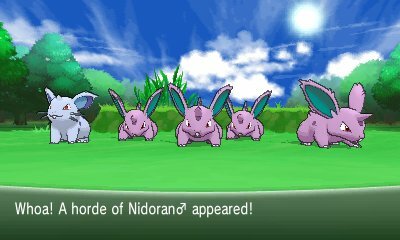 When you have a horde encounter, you will not always see five of the same Pokémon. 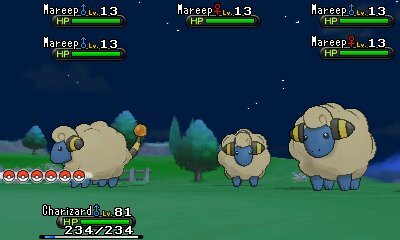 In these circumstances, you will see four of one Pokémon and one of another. In these situations, you will often find a variety of special instances. For example, in hordes of Seviper/Zangoose and Heatmor/Durant, the species that are the more plentiful will attack the one Pokémon. In others, the Pokémon will help boost eachother. Acid 30 40 100 The opposing team is attacked with a spray of harsh acid. The acid may also lower the targets' Sp. Def stats. Air Cutter 25 60 95 The user launches razor-like wind to slash the opposing team. Critical hits land more easily. Blizzard 5 110 70 A howling blizzard is summoned to strike the opposing team. It may also freeze them solid. Boomburst 10 140 100 The user attacks everything around it with the destructive power of a terrible, explosive sound. Bubble 30 40 100 A spray of countless bubbles is jetted at the opposing team. It may also lower the targets' Speed stats. Bulldoze 20 60 100 The user stomps down on the ground and attacks everything in the area. Hit Pokémon's Speed stat is reduced. Captivate 20 -- 100 If it is the opposite gender of the user, the target is charmed into harshly lowering its Sp. Atk stat. Cotton Spore 40 -- 100 The user releases cotton-like spores that cling to the target, harshly reducing its Speed stat. Dark Void 10 -- 80 Opposing Pokémon are dragged into a world of total darkness that makes them sleep. Dazzling Gleam 10 80 100 The user damages opposing Pokémon by emitting a powerful flash. Disarming Voice 15 40 -- Letting out a charming cry, the user does emotional damage to opposing Pokémon. This attack never misses. Discharge 15 80 100 A flare of electricity is loosed to strike the area around the user. It may also cause paralysis. Earthquake 10 100 100 The user sets off an earthquake that strikes those around it. Electroweb 15 55 95 The user captures and attacks opposing Pokémon by using an electric net. It reduces the targets' Speed stat. Eruption 5 150 100 The user attacks the opposing team with explosive fury. The lower the user's HP, the less powerful this attack becomes. Explosion 5 250 100 The user explodes to inflict damage on those around it. The user faints upon using this move. Flower Shield 10 -- -- The user raises the Defense stat of all Grass-type Pokémon in battle with a mysterious power. Glaciate 10 65 95 The user attacks by blowing freezing cold air at opposing Pokémon. This attack reduces the targets' Speed stat. Growl 40 -- 100 The user growls in an endearing way, making the opposing team less wary. The foes' Attack stats are lowered. Heal Block 15 -- 100 For five turns, the user prevents the opposing team from using any moves, Abilities, or held items that recover HP. Heat Wave 10 95 90 The user attacks by exhaling hot breath on the opposing team. It may also leave targets with a burn. Hyper Voice 10 90 100 The user lets loose a horribly echoing shout with the power to inflict damage. Icy Wind 15 55 95 The user attacks with a gust of chilled air. It also reduces the targets' Speed stat. Incinerate 15 60 100 The user attacks the target with fire. If the target is holding a Berry, the Berry becomes burnt up and unusable. Land's Wrath 10 90 100 The user gathers the energy of the land and focuses that power on opposing Pokémon to damage them. Lava Plume 15 80 100 An inferno of scarlet flames torches everything around the user. It may leave targets with a burn. Leer 30 -- 100 The opposing team gains an intimidating leer with sharp eyes. The opposing team's Defense stats are reduced. Magnitude 30 -- 100 The user looses a ground-shaking quake affecting everyone around the user. Its power varies. Muddy Water 10 90 85 The user attacks by shooting muddy water at the opposing team. It may also lower the targets' accuracy. Parabolic Charge 20 50 100 The user attacks everything around it. The user's HP is restored by half the damage taken by those hit. Perish Song 5 -- -- Any Pokémon that hears this song faints in three turns, unless it switches out of battle. Petal Blizzard 15 90 100 The user stirs up a violent petal blizzard and attacks everything around it. Poison Gas 40 -- 90 A cloud of poison gas is sprayed in the face of opposing Pokémon. It may poison those hit. Powder Snow 25 40 100 The user attacks with a chilling gust of powdery snow. It may also freeze the targets. Razor Leaf 25 55 95 Sharp-edged leaves are launched to slash at the opposing team. Critical hits land more easily. Razor Wind 10 80 100 A two-turn attack. Blades of wind hit opposing Pokémon on the second turn. Critical hits land more easily. Relic Song 10 75 100 The user sings an ancient song and attacks by appealing to the hearts of those listening. It may also induce sleep. Rock Slide 10 75 90 Large boulders are hurled at the opposing team to inflict damage. It may also make the targets flinch. Rototiller 10 -- -- Tilling the soil, the user makes it easier for plants to grow. This raises the Attack and Sp. Atk stats of Grass-type Pokémon. Searing Shot 5 100 100 An inferno of scarlet flames torches everything around the user. It may leave targets with a burn. Self-Destruct 5 200 100 The user attacks everything around it by causing an explosion. The user faints upon using this move. Sludge Wave 10 95 100 It swamps the area around the user with a giant sludge wave. It may also poison those hit. Snarl 15 55 95 The user yells as if it is ranting about something, making the target's Sp. Atk stat decrease. String Shot 40 -- 95 The targets are bound with silk blown from the user's mouth. This silk reduces the targets' Speed stat. Struggle Bug 20 50 100 While resisting, the user attacks the opposing Pokémon. The targets' Sp. Atk stat is reduced. Surf 15 90 100 It swamps the area around the user with a giant wave. It can also be used for crossing water. Sweet Scent 20 -- 100 A sweet scent that lowers the opposing team's evasiveness. It also lures wild Pokémon if used in grass, etc. Swift 20 60 -- Star-shaped rays are shot at the opposing team. This attack never misses. Synchronoise 15 120 100 Using an odd shock wave, the user inflicts damage on any Pokémon of the same type in the area around it. Tail Whip 30 -- 100 The user wags its tail cutely, making opposing Pokémon less wary and lowering their Defense stat. Teeter Dance 20 -- 100 The user performs a wobbly dance that confuses the Pokémon around it. Twister 20 40 100 The user whips up a vicious tornado to tear at the opposing team. It may also make targets flinch. Venom Drench 20 -- 100 Opposing Pokémon are drenched in an odd poisonous liquid. This lowers the Attack, Sp. Atk, and Speed stats of a poisoned target. Water Spout 5 150 100 The user spouts water to damage the opposing team. The lower the user's HP, the less powerful it becomes.